Rev. 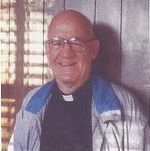 Joseph M. Kennedy, S.J. died Sunday night, 12 February 2012. He was a Jesuit for 69 years and a priest for 56 years. Burial will follow in the Woodstock Jesuit Cemetery. Hasten to meet him angels of the Lord!